The global leader in satellite navigation, Garmin has announced the launch of the touchscreen Oregon series of handheld GPS units, including Oregon 400t, Oregon 400i, Oregon 400c, Oregon 300 and Oregon 200. These rugged and waterproof handheld navigators feature high-sensitivity GPS receiver, preloaded mapping, 3-inch diagonal, sunlight-readable, color, touchscreen display as well as Garmin’s new HotFix feature that able to store critical satellite information for quicker position lock. 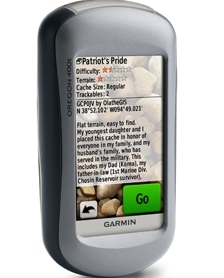 In addition, the latest Garmin Oregon PNDs also can support Geocaching.com GPX files for downloading geocaches and details, such as location, terrain, difficulty, hints and description straight to your device. Furthermore, users of Garmin Oregon can experience the newest GPS-based activity from Groundspeak – Wherigo, which is a toolset for creating and completing adventure games, historical tours or other innovative activities in the real world. The new Garmin Oregon 400, 300 and 200 GPS units that incorporate microSD card slot are expected to be available by 3rd Quarter, 2008 for $639.99, $533.32 and $479.99, respectively.